Our Transfer Pumps have inlet/outlet sizes ranging from 1" to 6" and they all work the same way; drawing in water through an inlet valve and dispersing it from a discharge valve. The larger sized pumps can get the job done more quickly; for example a 4" transfer pump will finish a job 4 times faster than a 1" transfer pump. 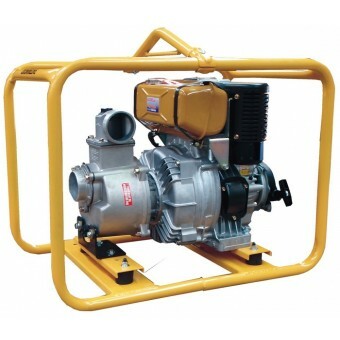 There are Petrol and Diesel powered Water Transfer Pumps available, powered by world leading engines from Honda, Subaru and Yamaha. To get the right pump for your water transfer requirements, ideally you should know how much water you need to move and what distance (including height differential) the water needs to be pumped; refer to the specifications on the product page for each pump's transfer capability. Important pump characteristics when considering any water pumps are: Pressure (PSI), Flow Rate, Maximum Head and Inlet/Outlet Size. Generally speaking, Water Transfer Pumps will have lower PSI capacity, but can move larger volumes of water (higher flow rates), whereas High Pressure Fire Fighting Pumps for example, will have a higher PSI but move lower water flow rate volumes on a litres per minute measure. All of our water pumps come backed with national service agency support in case you ever need pump spare parts, repair or inspection under warranty.